Finding the most ostentatious sounding tea in a supermarket possibly shouldn’t be too hard for me. In previous delusions of grandeur I exclaimed horrified in one Waitrose some time ago that they’d run out of Waldorf Salad! This Rooibos Crème Caramel couldn’t sound much more pretentious (moi? – for Fawlty Towers fans) if it tried. Naturally caffeine free with fifteen biodegradable tea temples, the usual smart cardboard box from Teapigs oozed modern sophistication. Oh, and the smell… one of the odd things as a food blogger I find is you end up sniffing teabags! These are probably the best smelling teabags ever. They are a mixture of naturally caffeine free rooibos and chunks of caramel. Sported as a dessert tea with only two calories, this tea is possibly fit for kings… and I have fifteen cups! The instructions suggest brewing for three minutes, but I’m a ‘builder’s tea’ type of tea drinker and left mine for ages. A drop of milk and a short wait to cool.... I immediately found that it was a bit odd drinking this tea at work. It felt like I should be somewhere else… like the top of an overly sunny mountain, surrounded by bonsai trees and scantily clad lady’s fanning me with big leaves, whilst someone out of eyeshot plays a harpsichord. This tea smells so good it’s difficult not to breathe it in through your nose whilst trying to drink it. 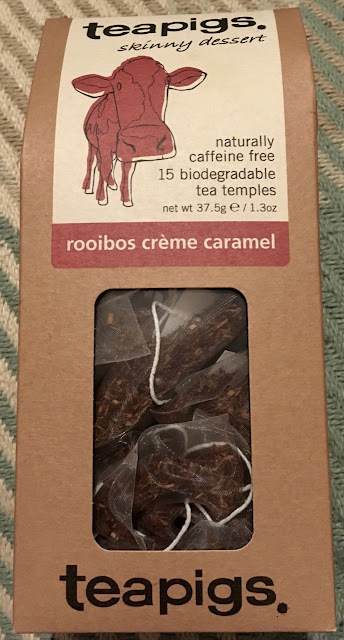 This tea made me want to live in a forest, with all the houses made out of wood, and all the insides of these wooden houses smelling of Rooibos Crème Caramel. People dress in togas, greeting each other in the woodchip streets, and praise the Rooibos Crème Caramel tea at the tea(bag) temple on the top of the overly sunny mountain listening to birdsong (after someone shot the harpsichord player). The rooibos hits the tastebuds first mixing quickly with caramel sweetness. It was then that the creaminess mixed with the milk which left my tastebuds on sumptuous velvety cushions. Adding sugar would probably be insane and only for fanatics. The box also suggests instead of adding milk, trying a spoonful of crème fraîche or possibly something I may try out of the office and its kitchen bustle is latte style; by covering a tea temple with boiling water for three minutes, then topping up with frothy boiling milk, and adding a dash of cinnamon… Pretentious Moi?